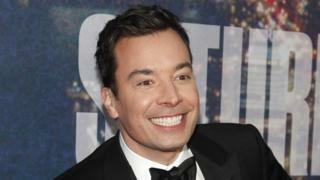 The Tonight Show host Jimmy Fallon has been announced as the host of next year's Golden Globe Awards. The 41-year-old wrote on Twitter he was "so excited" to be fronting the ceremony in January 2017. He takes over from Ricky Gervais, who presented it this year, and Tina Fey and Amy Poehler, who were hosts from 2013-15. Next year's ceremony takes place in Beverley Hills and is one of the biggest nights of the awards season. Fallon, who has been presenting The Tonight Show since 2014, joked he was "looking forward to spending time with the Hollywood Foreign Press before Donald Trump has them all deported". Robert Greenblatt, chairman of NBC Entertainment, said: "This is the most spontaneous and uninhibited award show on television, and Jimmy's playful, disarming comedic brilliance makes him the ideal host to enhance and elevate the sense of fun and irreverence." NBC will be broadcasting the awards live in the US. Some 18.5 million Americans watched this year's awards on TV. The Revenant dominated the 2016 Golden Globes, winning best dramatic film, best actor in a drama for Leonardo DiCaprio and best director for Alejandro G Inarritu.